Royal Enfield motorcycles are the subject of this blog but, if you shop for one online you are going to run into a lot of Royal Enfields of a different sort. No, not Enfield rifles, although there are many of those. Not Enfield china, although it exists. What you'll find again and again are Enfield tricycles. 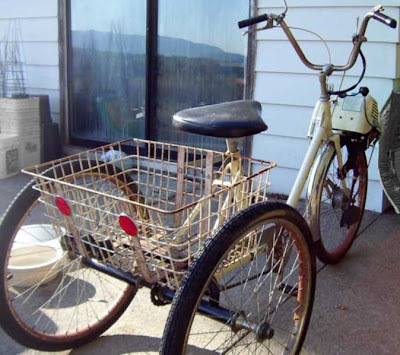 These are pedal pusher bikes, some of them with little motors like the one shown here, which is for sale on eBay in Earlton, N.Y. Blogger Jorge Pullin of My Royal Enfields pointed it out to me. Although Royal Enfield motorcycles are Jorge's main interest, and mine, I admit to some curiosity about these trikes. First, why are there so many for sale all the time? It's rare that I come across a Royal Enfield two-wheeler for sale. Second, why do they seem to come in so many varieties? There are red ones, blue ones. This one is cream color. 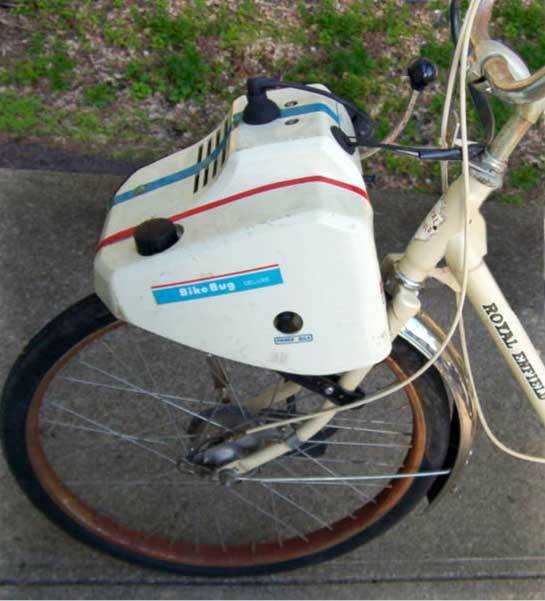 Some have a single speed, some three speeds, others maybe more. Some have front drum brakes, some just handbrakes on the front, but all seem to feature a shopping basket on the back, high riser handlebars and a spring seat. A few, like this one and another I've written about, have motors mounted on the front wheel. 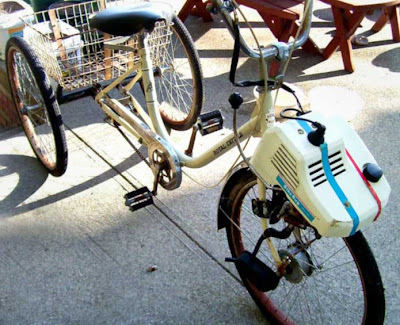 These appear to be Tanaka two-stroke motors sold under the Bike Bug brand name. 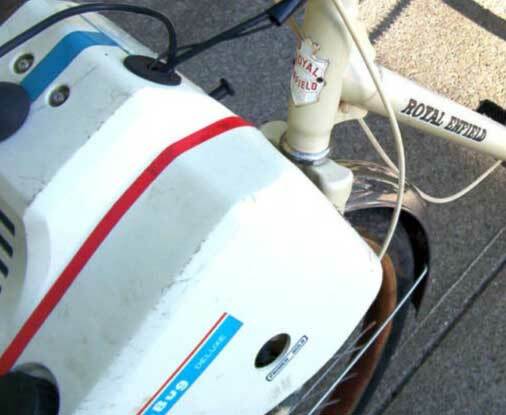 They are started by getting up to pedaling speed and dropping the motor's rubber roller onto the front wheel. 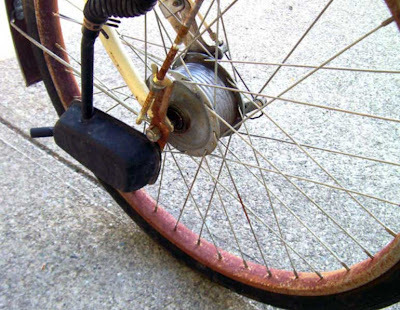 To stop, you have to almost simultaneously reduce throttle and pull the motor off the wheel, while applying the bicycle brakes! In an emergency it's apparently OK to just stall the motor with a firm application of the brakes. 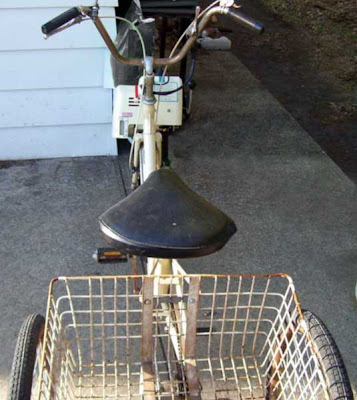 Most of the sellers don't seem to know much about these tricycles, motorized or not. Some claim they are from the 1950s, although the '70s and later seem more likely. Some claim they were made in Britain, but one owner mentions, online, that "mine has a sticker on the frame that says 'Made in Japan'." The step-through, deeply arched frame seems to be common to all: it must be very heavy steel to carry so much strain unbraced. What do these things weigh? The tricycle shown here is illustrated with a series of fascinating pictures. 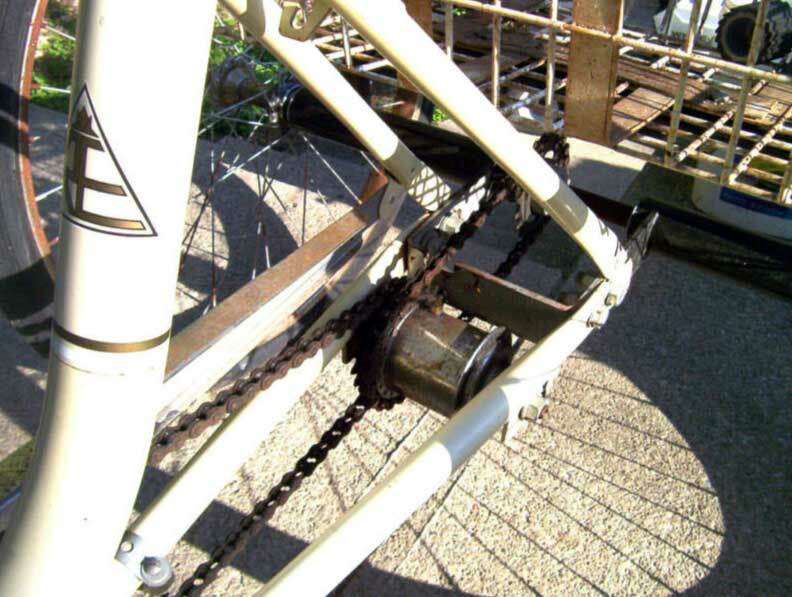 They show, for instance, how the three-speed hub is chained to drive the rear axle. I can't help wondering if any differential is provided. One writer, online, suggests not: "I went to ride and when I went straight it rode fast and smooth, then tried to turn and it was like putting on the brake; should the rear wheels move independently?" Geez, I would sure hope so! The tiny muffler is positioned by the nut on the front axle. The thumb control for this trike's three-speed rear hub is on the right; most English bicycles I've seen put it on the left (I'm not sure why). Mirror and front handbrake are on the left (as usual). The three-speed hub must also provide rear braking. The motor seems to have a throttle control on the handlebars, and a lever to put its roller drive in contact with the front wheel. As for why so many of these three-wheelers are always up for sale, my theory is this: they take up a lot of room in the garage. If they aren't being actively ridden, they're going to be offered for sale. Asking prices are typically three figures. The Buy It Now price for the one pictured here is $250.